An install-and-play version of HoMM3: WoG 3.58f, released in October, 2004. This version has become legendary amongst all HoMM3 players, reviving the game and bringing a new stream of modding. 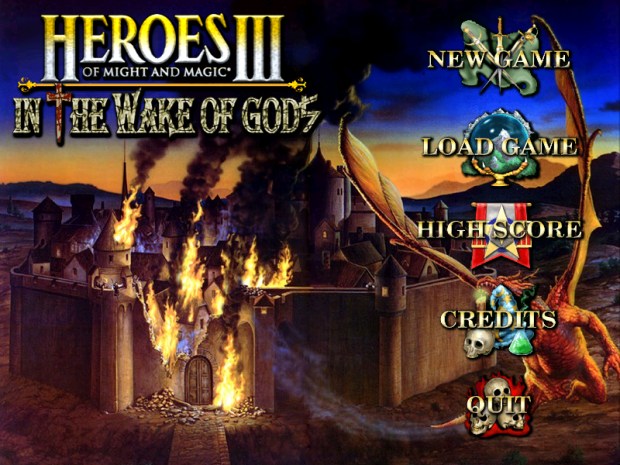 Currently, 99% of mods for Heroes of Might and Magic III are WoG-based. Requires original HoMM3: Shadow of Death installed. Easily one of the best mods ever. Feel free to push Track This Mod button. Many updates are coming - WoG 3.59 has started. Many aspects will be totally reworked, with new graphics and such. The new life is coming. I hope this is true. Really really hope. By the way, do any of you know where to get the old graphics and builsings packs with extra map objects? Send me a message! You can find them on Heroes Community or WoG forum. Look for Salamandre's threads on HC. Fred79's Object Patch for Era can help too, but you will need Era to be installed. Miraculously, we will wait for version 3.9. The main thing that did not replace the appearance of creatures and castles. And if you replace, let it be a script that allows you to return them to look. I've seen some fashion in which I was kind of creature. And it looks terrible. Just because of that, I stopped playing in Heroes. If changing the look, then make it look harmonious. I do not want that to one of my favorite mods died on Which stupid reason. Thank you. This mod seems playable without any previous versions of HOMM3 installed. You need Heroes 3 and Shadow of death at least installed. Or Heroes 3 complete. i just changed the lnguage of my system in control panel and it installed successfully. I rush to see the kremlin creatures(the reason I was attracted to this mod)! The music of the startscreen is majestic. something eith greek elements I bet it is, which track is it? Try again or register. ModDB is more tolerant towards registered downloaders. I seem to have a problem with installing the mod, I've changed my system location to English (US) and tried UK and also Russian but every time the installer tells me that it's recommended to do this, and then closes on itself. Anyone have any experience / ideas of what may cause this? Would love some help. Honestly I would recommend you to use Era 2.46 instead. It's an upgrade over WoG 3.58f which is more friendly towards users. It contains some unique features like portable mod managing, script editor and so on. Must be installed over clean Heroes Complete or H3 SoD. My norton antivirus says its insecure and deleted it. Does it work with HoMM3HD? More or less. You can change resolutions, but other HD Mod functionality is turned off for WoG and Era due to the uncatchable bugs caused by the WoG nature. HD Mod is optimized only for Heroes 3: Horn of the Abyss modification. The closer updates of HD Mod might contain steps towards solving this issue. when i try to play on singleplayer or multiplayer the game crashes why? Do you have any other mods installed? Did you install over clean English Heroes 3 SoD or Heroes Complete? I have found a game breaking glitch in one of the campaigns! In the campaign Life of A-D-V-E-N-T-U-R-E when you go to Emokon and have all the required stats for the Ghoul Lord quest (Def 6, Atk 6) when you kill the Ghoul Lord and try to exit I get a error. Even if you do both the options you will NOT be able to exit the cave and continue playing normally (except when you use a cheat to get out)! Hope this helps! The Installer does not seem to work for me. Do you happen to have a manual install version of it, with instructions on what to do? Can somebody please tell me how can I stop the trees' motion (it is tiring to the eye) and where the faction of KREMLIN is to be found and played? How can you play the original HoMM3 play again? Now that you dislike so much about WoG? I registered, installed and i got "access violation and a long log with numbers in it. Any idea what i can do? Gonna try, i love this game from when i was 10 years old, so much nostalgia. One of my best friend am me were playing this game for many years and i have invited other friends to join, every single friend i have like to play this. Russians know how to make good classics, speaking about age of pirates too. I prefer the Russian or EU industry rather the USA one. Hey mate. I have HoMM 3 with all theexpansions installed on my computed and I decided to install this mod. The installation went on without any problems. However, I don't know how to start the mod. Any advice?